The most recent Dialogue Incorporated development - which we can't believe hasn't been announced until now - is that our Creative Director, Joshua P. Ferguson, has taken up a new post as Nightlife Editor for Time Out Chicago magazine. What this means for Dialogue is that we're lucky enough to be able to link to his features, interviews, previews, and reviews here on the site so our readers/listeners have that much more content to enjoy. Weekly we'll be adding posts from JPF's contributions to TOC. Enjoy! Its name has been synonymous with peak-time dance-floor mayhem for two years. 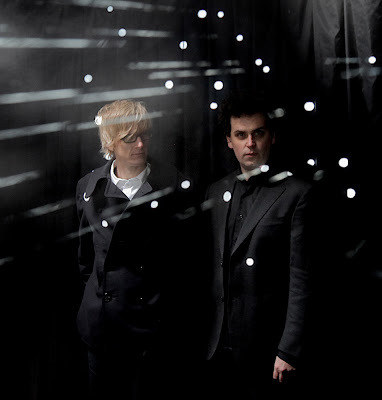 In 2007, Simian Mobile Disco’s (SMD) blend of infectious drums, electro crunch, indie bass-line bounce and notable guest vocalists elicited praise from the rock and electronic worlds alike. That’s the crossover appeal of most dance-music acts’ dreams. High-profile production credits for the Arctic Monkeys and the Klaxons didn’t hurt his chances for success, but for London-based James Ford, who, along with longtime bandmate James Anthony Shaw (nicknamed Jas to avoid confusion), is now signed with U.K. indie label Wichita as SMD, the path to stardom was more of a free-form occurrence than a calculated record-label marketing move. “We’re both jacks-of-all-trades,” says Ford on the phone from New York, where he’s doing studio work for one of his many side projects. “We just try lots of things out and make decisions later down the line if we like it or not." The sessions that became their debut album, Attack Decay Sustain Release, amounted to more than fooling around in the studio. Among a sea of sweaty revelers, the typical reaction to an SMD song entails dancers jumping up and down, chanting along to the lyrical snippets that have become a signature of its production style. Live Review: M. Ward | Rave On!